1온스 2013 소비자 보호운동 실버라운드 산타클로스와 휴일보다 더 상징적인 몇 가지가 있습니다. 원래 메세지와 목적과는 달리, 오늘날의 휴일의 의미는 선물을 주는 것에만 치중되어 있습니다. With "Black Friday" and "Cyber Monday" sales taking over the nation every year, Consumerism has killed a once beautiful holiday. 하이디 와스트위트의 이 라운드 디자인은 상징을 다루며 소비 강박증을 유형화합니다. 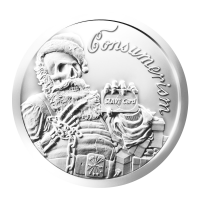 The skeletonized Santa Claus holds a familiar credit card with words "Slave Card" replacing the brand name and instead of his usual accoutrements he holds a chain of slavery in his right hand and his belt buckle is emblazoned with the five arrows of the Rothschilds family crest. 배경은 전에는 단지 가끔 휴일의 일부였던, 하지만 지금은 유일한 목적이 된 선물들이 있습니다. 소비주의라는 단어가 친근한 서체로 동전 위에 새겨져 있고, 휴일의 상품화에 경의를 표할 뿐 아니라, 시스템적인 문제에 빛을 비추고 있습니다. 광고는 우리 삶의 다양한 측면을 지배하고 있습니다. 뒷면에는 기준 SBSS 문장과 메세지와 '2013'이라는 연도가 나와 있습니다.